Say goodnight to America's man-child-in-chief with this bestselling and wickedly funny parody. Turn out the lights on Trump's America with this hilarious yet poignant call to action. 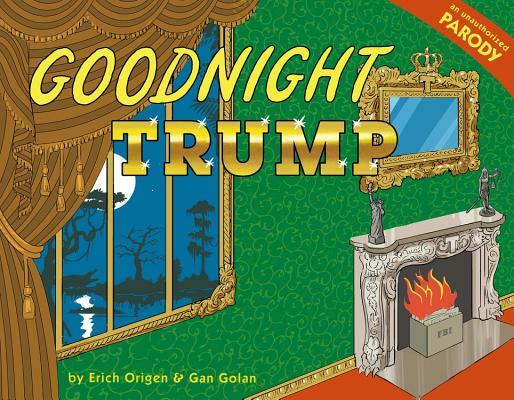 Erich Origen and Gan Golan are the New York Times bestselling authors and illustrators of Goodnight Bush, The Adventures of Unemployed Man, and Don't Let the Republican Drive the Bus. "Less as an exhalation and more like a spell to soothe the fried nerves of the frazzled left... a litany of accusations against the president's crimes against humanity and taste, juxtaposed for maximum horror and revulsion. There are sick burns, too, though it's not likely the president would receive them as such."